CoffeeBreak is an e-newsletter distributed to Averett faculty and staff to keep them up-to-date on campus activities and information. Please send information you would like included in CoffeeBreak via this form. Please submit by Monday, Nov. 26, for a Wednesday, Nov. 28, publication. The CCECC is partnering with the Boys & Girls Clubs of the Danville Area to host the Angel Tree Celebration for the 5th year in a row. The Angel Tree Celebration will be on Tuesday, Nov. 27, from 5-7 p.m. The CCECC is looking for volunteers for the celebration. To volunteer sign up by clicking here. As part of our new T.R.U.T.H. Talk series, the CCECC and Student Life present former Lt. Governor of Virginia Bill Bolling on Tuesday, Nov. 27, from 11 a.m. to 12:45 p.m. in Pritchett Auditorium in the Violet T. Frith Fine Arts Center. We will have refreshments available in the lobby from 11-11:30 a.m., and the presentation will start promptly at 11:30 a.m. There will be time for questions and answers. Community members are invited, so please spread the word. The last day for drop-in consultations in the Writing Center is Wednesday, Nov. 28. The last day for regularly scheduled tutoring sessions and open group tutoring opportunities is also Wednesday, Nov. 28. Should you find yourself needing assistance after Wednesday, Nov. 28, please email Holly Kilby at hkilby@averett.edu with your request and you will most likely be scheduled with a professional tutor/consultant for assistance. The Averett Music Department renews the tradition of “Averett Celebrates Christmas” with a collaboration of student and community performers. Join us to awaken your Christmas spirit and sing along! Performances from Averett Singers and the Alumni Chorus, the AU Cougar Band and solo handbell tree. Averett Celebrates Christmas will take place on Thursday, Nov. 29, at 7 p.m. in Pritchett Auditorium, in the Violet T. Frith Fine Arts Center. Admission is FREE! Faculty, staff, spouses or a guest are invited to celebrate the holiday season with President Tiffany Franks and Joe Franks on Thursday, Dec. 6, from 4:30 – 7 p.m. at the President’s House, 500 Hawthorne Drive. 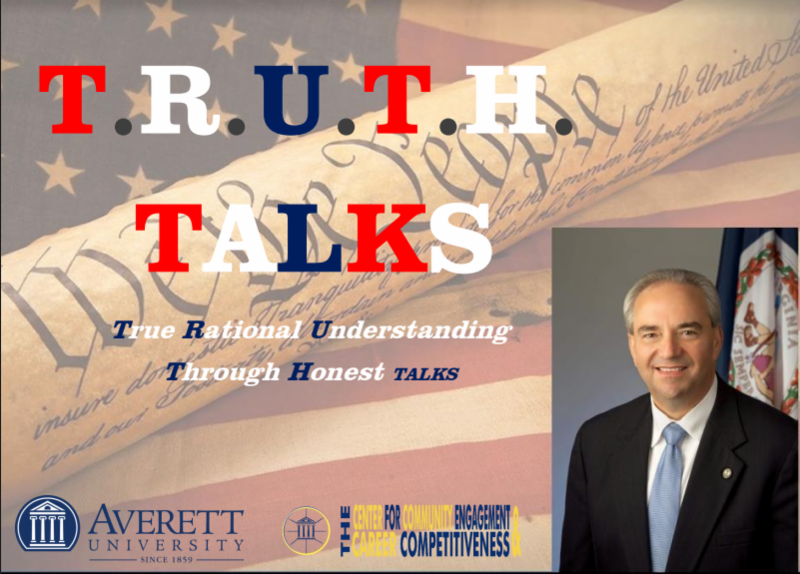 Please reply to cbasinger@averett.edu or call x15671 with number of guests. Thank you so much to everyone who participated in the faculty/staff giving campaign. We are currently at 62% giving – including gifts and pledges! Even though the drawing is over, it is not too late to give. Please be a part of the percentage of folks giving to Averett! It doesn’t matter if you give $10 or $10,000 – you are still a part of the percentage. Congratulations to the winners of our drawing. Everyone who gave by Oct. 31, was entered to win a prize. The winners are: Mary Sullivan, Travis Williams and Wanda Haynes. Dr. James F. Hodgson, sociology/criminal justice program director and professor of sociology and criminal justice for GPS, was elected as the president of the Virginia Association of Criminal Justice Educators during their annual conference hosted by Averett in October 2018. The Mission of the Virginia Association of Criminal Justice Educators is to advance, inspire and promote the highest quality and practices of criminal justice education to students and practitioners in the community colleges, and universities within the Commonwealth of Virginia; to foster communication and support among all criminal justice educators in Virginia; to inform the membership of pending (or possible) changes in criminal justice programs or agencies among the post-secondary educational institutions in Virginia; to articulate a unified voice for official communication with other educational agencies, organizations, and/or the Commonwealth of Virginia; and to enhance the quality of life-long educational experiences and opportunities for our criminal justice students. The goals and objectives of the Virginia Association of Criminal Justice Educators include the raising of professional standards in criminal justice education; recruiting more academically and professionally academy levels; studying the possibilities of full utilization of community resources in the criminal justice field; and to search continually for new techniques and programs to assist criminal justice education in the Commonwealth of Virginia. Dr. Hodgson noted that that he looks forward to operationalizing the mission and objectives of the Virginia Association of Criminal Justice Educators in increasing educational access, options and opportunities for criminal justice practitioners and individuals who are seeking careers in criminal justice. Meet Matthew Miller, a student pursuing his Bachelor of Business Administration degree who is expected to graduate in 2019. To learn more about Matthew on this GPS blog, click here.